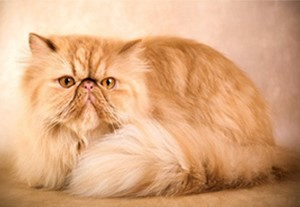 Meet Crumble, she is a beautiful Persian cat who was brought into The Vet for a behavioural consultation with our behavioural expert, Hollie Castledine. Poor Crumble kept having accidents on the floor before she could make it to her litter tray and her owner just couldn’t understand why. Hollie did a thorough investigation and determined that because Crumble’s accidents only happened randomly, it was classed as an “unpredictable” behaviour. Hollie discussed with Crumble’s owner that unpredictable behaviours are often caused by an underlying medical issue rather than a behavioural one. So Crumble had a blood test, a urine sample and ultrasound and it was revealed that she had a mild form of Polycystic Kidney Disease. It is likely that when Crumble’s bladder is full, it causes pain in her kidneys which either makes her want to go to the toilet immediately, or she may have learnt to associate her litter tray with the pain caused by the disease when urinating. We have started treating Crumble for her polycystic kidney disease which will prevent the disease from getting any worse and will relieve her from the pain and hopefully she will be able to live her life happily without any accidents or pain! Behavioural problems can be very complex and have lots of different causes. If you are concerned, we highly recommend you visit our veterinary behavioural expert Hollie, she will do a thorough physical examination, try and get a good idea of your pet’s normal behaviour, their environment and living arrangements, which will help her to identify any behavioural or underlying medical problems. If you are concerned about your pet’s behaviour, please contact The Vet for more information.